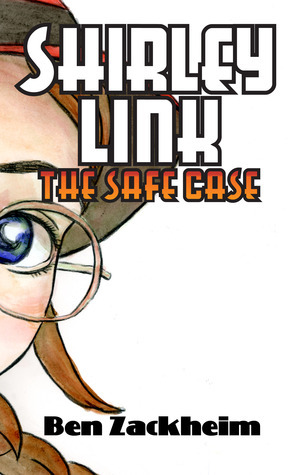 Title: Shirley Link & The Safe Case, by Ben Zackheim, 39 pages (there is some confusion; the paperback may be 102 pages? The book is short, however, at under 10,000 words). Publisher: Smashwords edition, orig. publication 2012. Shirley Link is an 8th grader with an unusual talent: she can solve mysteries the way other kids decode text messages. Shirley reminds me a bit of Sherlock Holmes, or Hecule Poirot, because she definitely uses the little grey cells, solving the case through careful observation (a la Holmes) and deep thought. In this debut novel, Shirley takes on the problem of a large sum of money that has gone missing from the school safe. Actually, the whole safe has gone missing, which is a mystery in itself, as it is larger than any of the doors or windows. But have no fear: Shirley is on the job, and the mystery doesn't stand a chance. I liked Shirley from the moment she turned in her "What I did with my summer vacation" paper and got a D for writing fiction (okay, she was telling the truth, but still. . . ). She's an insightful narrator with a touch of cynicism and just enough hubris to make it clear she's human. She reveals herself well in her narration, and describes other characters, inside and out, with a few well-chosen words. An example I liked was when she notes that the principal looks especially harried because "his eyeglasses sit on his nose like they want to escape his face." One quibble: Shirley herself is 14 (according to the blurb), and although the opening line speaks of her 8th grade English class, she apparently attends a high school. At 14 my sons started 9th grade (which unlike 8th is commonly in a high school), so I did wonder if this was an error. The story is well-written and fast-paced, the language is imaginative, and the denouement is reasonably surprising. A dry sense of humor kept me smiling, and I think this will work very well for the kids, too. My biggest issue is that the book is just too short! I'm just starting the next book, but it, too, clocks in about 10,000 words. Since the writing style of the books is firmly middle-grade (and an 8th-grade protagonist fits that very well, along with the minimal violence and clean relationships), that seems pretty short--more novella than novel. The writing should match kids at a pretty high reading level, so I hope that future books in the series are longer and more complex to challenge them more. Though Mr. Zackheim might be onto something, with some kids these days being too used to tweets to have patience for a longer story. Highly recommended, for mystery fans of all ages from 9 or so up. Full disclosure: I picked this book up as a free promotional copy, because the author was participating in a publicity campaign in which I was also involved. Nonetheless, there is no expectation of a positive review, or indeed any review, and the opinion expressed herein is my own honest opinion. I keep meaning to sign up for that challenge, just for fun. It's not like I don't spend half my time reading kids' books anyway! I read one of the books with my kids - they really enjoyed it! My daughter read the rest of the books as well. She thought they were a (refreshlingly) easy read. I think every now and then she wants to read something a bit easier and just take a night or two to tear through a book. She enjoys a certain sense of satisfaction (as do I) whenever she completes a book. That makes sense, Renee. And since the books aren't simplistic, just brief, they don't insult the child in the process. They actually seem perfect for those kids (I was one) who have a reading level above their age and interest level. Boy, I'm not sure how I missed this review. Thank you, Rebecca! And thank you Jemima and Renee for letting Shirley into the house. On your point about the length of the books, they do indeed get a little longer with #s 3 and 4. I needed some room to develop the characters and the bigger page count gave it to me. Initially, I made the books short because many of the kids I have in my life have, um, short attention spans, to say the least. They were my test audience for the first two books. I see the Shirley stories as being little dips into another world, if that makes sense. Re: the middle school/high school mix up. My experience was in a school that had the middle school attached to the high school. I realize after reading your review that it's unusual. I'll head in and edit it to make it clearer. Ah, the wonders of self publishing! I miss writing Shirley as I prep The Camelot Kids for release. But I'll get back to her one day. Thanks again for this wonderful review! Hi Ben! I'm glad you found it, in any case!